Ono no Takamura served as a high-ranking official at the court of Emperor Saga in the ninth century. 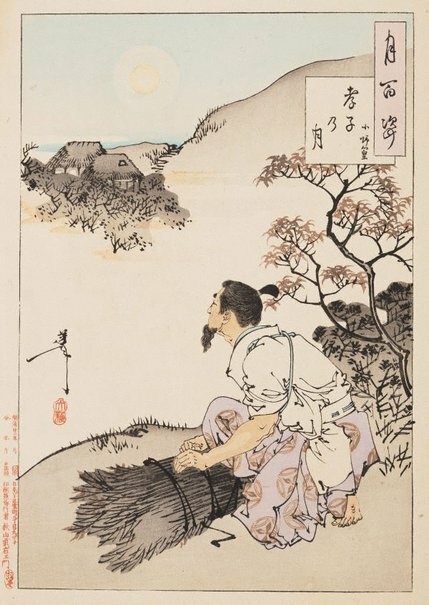 Renowned as a poet and calligrapher, Takamura was also often praised as a model of filial piety and generosity. He tended to share his stipends with relatives and friends who were more in need than him and showed great respect to his parents. The iconography could also refer to Ceng Shen, an important disciple of Confucius, who is credited with the compilation of the Twenty-Four Paragons of Filial Piety. Legend has it that Ceng was gathering brushwood in the forest one day when he had the premonition that his mother needed him. He hurried home to find that she had missed him so much she had bit her finger hard in vexation.